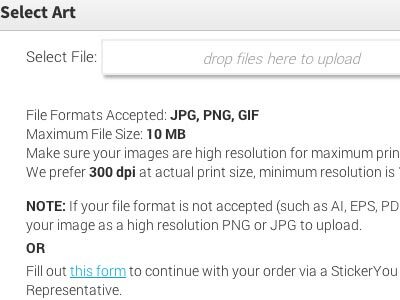 You can upload images that are no larger than 10 MB in file size and of types PNG, GIF, or JPG. A PNG image is best to ensure your final print is as close as possible to the colour you saw on screen. We can work with larger files and more file types for custom orders processed by our art team. Please email us for more information.